Changing focus from our all-biomechanics-all-the-time work from last time, we switched gears to working through a whole slew of different pole and cavalletti exercises to get the horses thinking about their bodies and the riders making precise and accurate requests. Despite a light drizzle and some wet grass, Dino showed up ready to rock and roll. It was really nice to only have to rev the engine a little bit during warm-up, which consisted of just very basic w/t/c and some changes of direction around the perimeter of the jump field. Once the horses were nice and forward, our trainer asked us to start adding in half halts every few strides to balance the trot. Dino was super enthused to be working that day, and interpreted each half halt as a canter aid. I'm not going to complain about that mistake! We then started working in a line of walk poles, which have become Dino's favorite since they were first introduced during our winter of lessons at the Very Fancy Barn, where they totally blew his little mind. I tried hard not to change my supportive position and forward aids as we looped over the poles, letting Dino bring the energy into a rounder, higher step instead of just letting him fizzle out through the walk poles. We did the same work over trot poles, paying attention to keeping the horses balanced and on the aids before, over, and after the poles. For Dino and I, staying truly forward when we weren't riding over the poles was the main focus, as well as remembering to use my inside leg to push him out to my outside hand around the turns instead of just, like, yanking him around with the inside rein. Because this is dressage, people, and the inside leg is a thing. I'm obsessed with his shiny fall coat! My memory of the lesson gets fuzzy at this point four days out from the actual experience (I must be getting old) but we may have added in canter transitions and circles at this point after riding over the trot poles, with straightness taking top priority before and after each transition. Riding out in the big field has its advantages when it comes to learning to ride straight - there is no wall or rail to keep your horse in line, just your aids! If I wasn't riding Dino straight, the canter depart would either not happen, be inverted, or be on the wrong lead. I need to take a LOT of accountability for straightness out in that field. After working on trot poles, we started in on a fun exercise that included free walk over poles as well as trot and canter circles. Our first attempt wasn't bad, but it wasn't as precise, fluid, and organized as I wanted it to be. I was getting a little rushed in anticipating each movement, and Dino picked up on that and got tense and balled up as well. A good thing to remember for future dressage tests! My trainer suggested that the next time I went through the exercise, I should ride it with my eyes closed to facilitate my feel of what was going on in Dino's body, as well as to prevent my gaze getting just a little too intense and anticipatory. I just want to take a moment here and say that Dino is actually a unicorn, because what other pony can you ride in a huge, open field with deer hiding in the woods at each end and do a dressage/pole pattern WITH YOUR EYES CLOSED?! No other pony. None. While I was thinking a little too much about how I was going to navigate with my eyes closed, when I relaxed and focused on Dino instead of "ARE WE GOING TO CRASH NOW!? ", the whole picture really improved. I was able to find my Magic Suction Cups TM position, Dino got softer, and there was a whole lot less tension involved. Flying blind the second time through going in the opposite direction, I was able to let go a little more and center myself, focusing more on the feel than the logistics of the exercise. I felt my ribcage get wider and press out into my upper arms (a feeling I'm trying to lock onto), and my trainer was really pleased with the free walk that time around even though I felt like I lost Dino in the contact a little bit. The canter work was absolutely the best we'd done all lesson so far - soft, round, and forward - and I was definitely happy with the improvement we had made! We finished the lesson with one more exercise: Trotting around a 20m-ish circle set with three cavaletti raised about 6" off the ground, followed by a canter circle and then coming back through the walk poles. If you ask Dino, he'll tell you that this was the BEST DRESSAGE LESSON EVAH because he got to JUMP THINGS! I couldn't keep from laughing as Dino launched way, way too enthusiastically over each tiny cavaletti like he was blasting around the stadium ring. We performed the exercise with flair, if not with accuracy and calm focus! His exuberance made for a rather disorganized pattern, so we tried again and I made my best effort to really half halt and slow the trot before each little "fence", thinking that SURELY Dino couldn't jump to the moon from such a slow trot. I think it might have even helped him rock back more on his haunches to get an even bigger launch over the cavaletti! He was absolutely hilarious, but I managed to keep it together enough to finish the pattern with some really lovely canter work and smooth, balanced transitions down to trot and then walk to end with the walk poles. I was happy and satisfied with how we'd improved over the lesson, and I think Dino really had fun! When Dino is back to fighting form, I'm planning on focusing on jumping as much as I can, but will definitely keep experimenting with riding with my eyes closed. 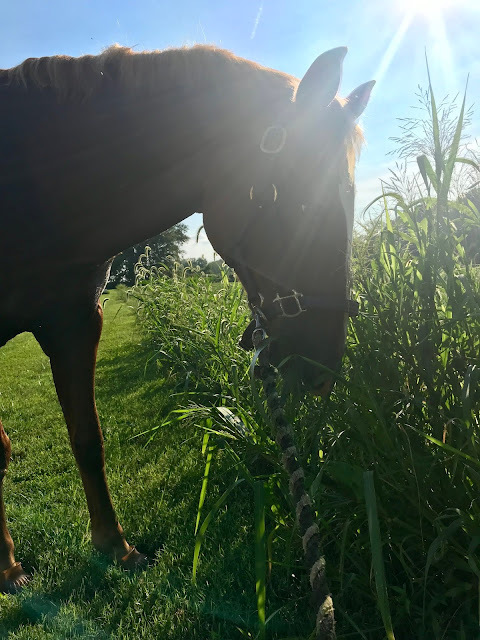 As a rider who can get way too over-focused, intense, and anxious, it was a really interesting tool to help me tune out my own mind and feel my pony. In the meantime, I'd covet your prayers and well wishes for my main man's recovery! Feel better Dino! Sending good vibes your way! what a cool lesson!! it always blows my mind how much more i can feel when i close my eyes.... but, ya know, i just like, don't do that very often for reasons and stuff haha. hope Dino feels better soon!